Townhouses at 538 Eglinton Ave. E.
It's no secret that the coming Eglinton Crosstown LRT has been attracting developers to the uptown Toronto avenue like wasps to a fruity summer cocktail. There's heaps of money to be made providing TTC-accessible living space to young professionals and their families; people who, at this point, can only aspire to buy a "real" home, especially in such pricey eastbound neighbourhoods as Sherwood Park and Leaside. In the midst of all this fast and furious (and sometimes, sketchy and shoddy) low- to mid-rise construction, one small townhouse complex stands out. 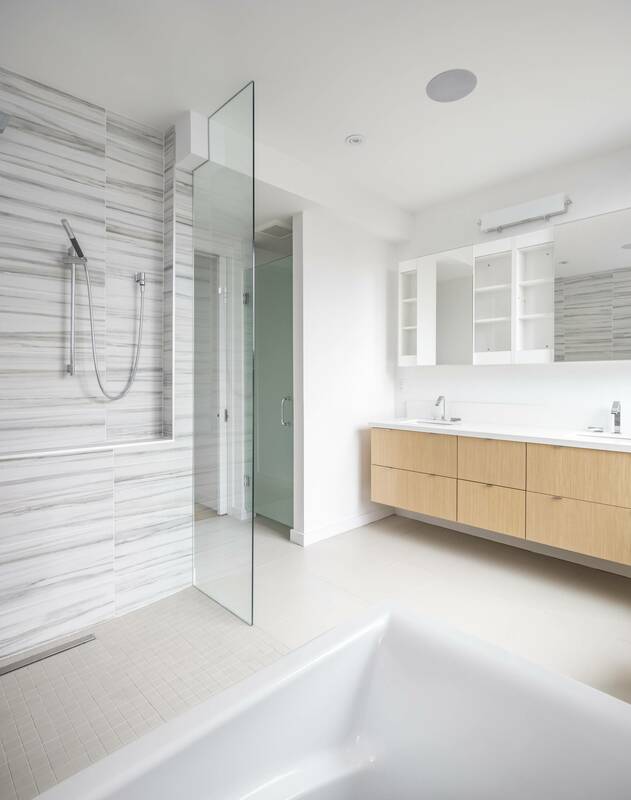 Built a year ago by Mazenga Building Group with a design team led by Jodi and Andrew Batay-Csorba of Batay-Csorba Architects, assisted by Turner Fleischer Architects, it answers a question that city planners seem too busy to ask. Namely, how do you create modern, well-structured housing that makes a design statement and yet does not overwhelm its surroundings? Large, angled windows set into ashwood surrounds lend a kinetic liveliness to the exterior of the townhouses. The three-and-a-half-storey structure at 538 Eglinton Ave. E., near Bayview, presents four integrated façades to the avenue, three more to the side street running north. Its L shape is split down the middle by a parking garage topped with second-level fenced patios, making both housing rows appear as distinct groups and thus less imposing in mass. Aiding this trompe l'oeil effect is the use of dramatic black brick on the more energetic Eglinton side and a soft taupe-grey brick on the residential side. However, what really reduces the structure's volume to manageable proportions, not to mention pleasing the eye, is its series of large angled windows set into ashwood surrounds. These rise from left to right to centre with each storey, lending a kinetic liveliness to each façade, an effect that multiplies across the grouped homes. In the best Mies van der Rohe tradition, these upper levels literally overshadow the quiet, wood-framed doorways beneath, making them appear even more private. Large glass panes extend from floor to ceiling on the main level. 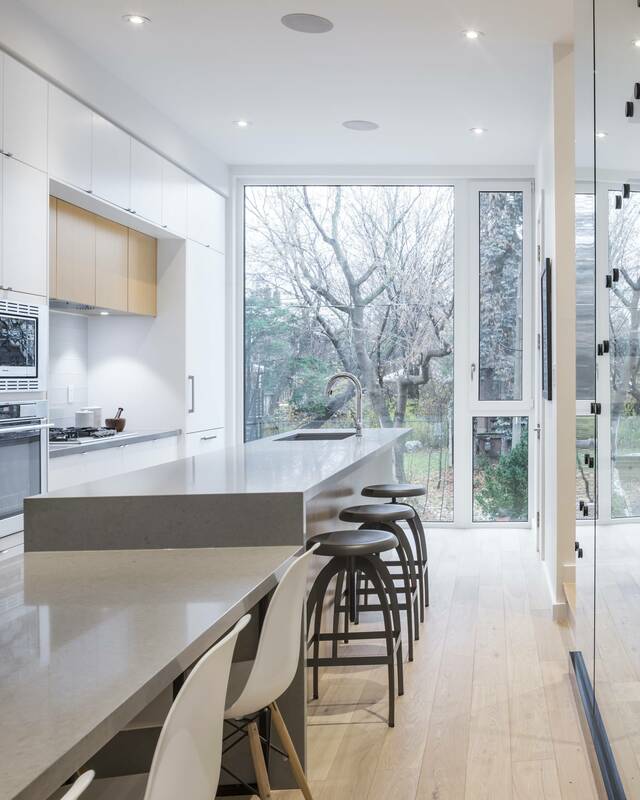 As iconoclastic as these windows may seem, they are in fact a tribute to time-honoured Toronto residential style. "They started as inverted bay windows," designer Mr. Batay-Csorba says. "Like the traditional bay, they provide a focal point. The different angles provide movement but it's relatively restrained." Their ashwood surrounds – thermally treated to mellow into grey tones over time – visually extend the metaphor, slicing into the building's angled sides as if they are thrusting outward. On the more practical end, every window manufactured by Newmarket's Tiltco Fenestrations offers tilt-and-turn operables for adjustable air flow. Inside each home, light itself flows from front to back courtesy of large glass panes that, on the main level, extend 10 feet from floor to ceiling. In the back, a glazed doorway leads to a fully private fenced patio, obviating the need for concealing curtains and thus extending the home's space both in visual and usage terms. Like the typical Toronto row house, there is a real need to do this, as the average unit's dimensions are 42 feet long, yet only 14 feet wide. Mr. Batay-Csorba says he and his partner maximized space wherever possible to make it feel wider. "We put in a thickened wall that extends from the kitchen through to the back living area, which allows for an incredible amount of streamlined storage. We also used glass guardrail stairways with floating treads on every floor, which gives an extra three feet of visual width." Top: The kitchen's soft grey island and white oak floors make the room feel light and airy. Bottom: The ensuite bathroom has a 'wet zone' of unenclosed shower and tub. White walls, a soft grey kitchen island with an optional dining extension, engineered white oak floors and warm oak built-in shelves also make the main room feel light and airy. That expansive sensibility rises with the open staircase through to the second-floor master suite – sizable for its class, with a walk-in closet and ensuite bathroom "wet zone" of unenclosed shower and tub. It carries on through to the two third-storey bedrooms, one with a tempered glass balcony, and up to a top-floor family room set with glass sliders leading to a fenced-off roof deck. Reaction to 538 Eglinton East – from its homeowners and surrounding neighbours to the design community at large – has been highly positive. Erik Bornstein, principal with Mazenga Building Group and project manager on the build, says it has turned into a statement piece for his company that, up until now, had worked exclusively on upscale single-family dwellings. "We bought the development from another company," Mr. Bornstein says. "They already had building plans in place, but we decided not to go the cookie-cutter route just for the sake of making a few bucks. We wanted to showcase Mazenga's construction capabilities on a multiunit dwelling to set a standard in design, details and quality of material. So we worked really hard to ensure the spaces were well built and well thought out." Mazenga works closely with their high-profile design teams, including the multiple-award-winning Batay-Csorba Architects, which is a frequent collaborator. Mr. Batay-Csorba calls the Eglinton project an exciting effort, one that "distinguishes itself in the quality of the product, comparable to a high-end residential project," and credits Mazenga for insisting on "a design that would be visually appealing, something different from what is typically offered in the market of townhouse developments." The townhouses mesh seamlessly with the neighbourhood. Spending time, money and effort to create something truly memorable, yet unobtrusive in its context, massed homes that mesh seamlessly with the splintered character of a busy thoroughfare adjacent to a subdued tree-lined street is not a common trait in Toronto's rabid construction scene. The townhouses represent more than just a statement piece for their builder, they are a clear signal that more can be done to raise this city's housing stock from the merely liveable to the truly wonderful. Unfortunately for us all, Mr. Bornstein says his company at present has no further development plans along the Eglinton corridor.